An international team of astronomers has discovered a compact analogue of our inner solar system about 40 light-years away. Brice-Olivier Demory of the Center of Space and Habitability at the University of Bern, analysed the data collected with NASA’s Spitzer Space Telescope and calculated that the newly detected exoplanets all have masses less or similar to the Earth. TRAPPIST-1 is the name of the small, ultracool star that is the new hot topic in astronomy and the search for life outside our solar system. Observing the star with telescopes from the ground and space during an extensive campaign, an international team found that there are at least seven terrestrial planets around TRAPPIST-1. Their temperatures are low enough to make possible liquid water on the surfaces, as the researchers report in the journal «Nature». «Looking for life elsewhere, this system is probably our best bet as of today», says Brice-Olivier Demory, professor at the University of Bern’s Center for Space and Habitability and one of the authors of the «Nature» paper. The configuration of these exoplanets orbiting a dwarf star makes it possible to study their atmospheric properties with current and future telescopes. «The James Webb Space Telescope, Hubble’s successor, will have the possibility to detect the signature of ozone if this molecule is present in the atmosphere of one of these planets,» explains Demory: «This could be an indicator for biological activity on the planet.» But the astrophysicist warns that we must remain extremely careful about inferring biological activity from afar and that everything could be different than expected. A year ago, the astronomers had already detected three Earth-sized planets orbiting the star TRAPPIST-1. The planets pass in front of the star in so called transits and periodically dim the starlight by a small amount. After this discovery the researchers observed the star for months with different telescopes in Chile, Morocco, Hawaii, La Palma and South Africa, and in September 2016, NASA’s Spitzer Space Telescope monitored TRAPPIST-1 for 20 days. 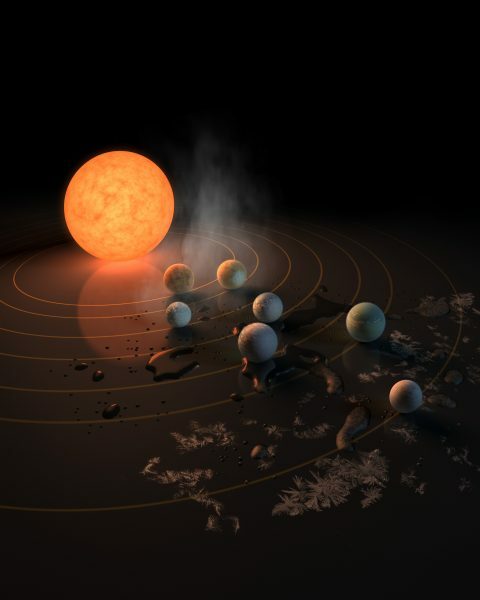 Exploiting all the data the astronomers found that the TRAPPIST-1 system is a compact analogue of our inner solar system with at least seven planets. «My task was to make an independent analysis of the Spitzer data as well as a dynamic analysis of the system that allowed to compute the masses of these planets,» explains Demory. He found that some of the detected planets have densities similar to the Earth and most probably a rocky composition. In a paper published in October 2016, two researchers of the University of Bern, Yann Alibert and Willy Benz, had already predicted based on their computer simulations that such planets around dwarf stars should be common. Earth-like exoplanets orbiting dwarf stars are easier to observe than real Earth-twins around solar-type stars. Since these dwarfs are also much cooler, the temperature zone that allows water to be liquid on the surface of the planet is much closer to the star. And exoplanets that are close to their host star revolve more rapidly and produce more transits in a given timeframe. «About 15 percent of the stars in our neighbourhood are very cool stars like TRAPPIST-1,» says Brice-Olivier Demory: «We have a list of about 600 targets that we will observe in the future.» To monitor the candidate stars in the northern hemisphere the Center for Space and Habitability (CSH) of the University of Bern is leading a consortium that builds a new telescope in Mexico. Short talks and panel discussion with Prof. Brice-Olivier Demory, Prof. Yann Alibert, Prof. Kevin Heng, Zoë Lehmann and Science Fiction author Laurence Suhner, who published a short novel about TRAPPIST-1 in Nature.